Now that tax season is here, consumers are looking for a reliable, easy way to file their taxes. Why not use an online tax service? These services allow you to easily and safely file your taxes online from the convenience of your own home. And the best part is they can cost much less than using an accountant. 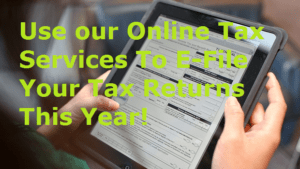 For those of you who are either new to e-filing or filing in general, it may be hard to determine the best online tax service for you because many seem to have similar pricing or share similar features. To save you some of the hassles, we’ve highlighted which services we feel are best for all filers, best for audit support, best for your wallet and best for basic returns. Turbo Tax and H&R Block are offering an extra incentive to file your taxes with their software: 5% or 10% FREE when purchasing an Amazon Gift Card. When filing your taxes with TurboTax, you will have the option to put aside some of your refunds for the purchase of an Amazon.com Gift Card. If you choose to use part of your refund for the Gift Card (set aside $100 for the Gift card and the rest of the refund will be deposited into your bank account), TurboTax will give you an addition 5% or 10% bonus; 5% more when using the TurboTax Federal Free Edition, 10% if using Deluxe, Premier, or Home & Business. All you need is the Amazon.com Gift Card claim code, which will be sent to you automatically once your refund is ready. The bonus is FREE and gift cards never expire! This year, TurboTax offers an extra incentive to file your taxes with their software: 5% or 10% FREE when purchasing an Amazon Gift Card. TurboTax is an easy and straightforward platform to use. It has an interface that guides users through the filing process by leading them to questions in plain English so they do not have to try to decipher the complex language of the tax filing system. The clean interface and trustworthy mobile platform help allow customers to easily report taxes efficiently and thoroughly, with software that automatically rechecks answers and allows customers to circle back and forth through sections to double-check that everything has been entered thoroughly. It also provides help in using the site and entering information correctly via an online chat or phone number which connects you to a Tax professional. TurboTax is one of the most respected of the online tax submission companies, competing with very high-level companies like H&R Block and TaxACT. Unlike H&R Block, TurboTax is based online, but that doesn’t mean the customer does not have access to excellent customer service 24 hours a day and help during the filing process. One large feature offered by TurboTax is the ability to use the software for free until the point of filing the taxes (thereby confirming that they provided the customer with an excellent platform which the customer is now willing to pay for). This means that a customer may begin filing taxes using TurboTax without fear of having made the wrong choice. TurboTax also offers a guarantee to provide the maximum refund/tax returns, one-on-one audit counseling in the case that a customer should be audited, and a guarantee that calculations will be correct, or TurboTax will reimburse the customer should any calculations be incorrect. TurboTax offers a number of tools for estimating taxes and refunds, and many resources for filing correctly, and it also allows you to remove any fees charged by TurboTax from the refund you are getting by using it. When filing your federal taxes with TurboTax, filing state taxes is almost automatic. TurboTax will transfer your information to TurboTax State and provide you with the option to complete your state taxes using TurboTax. The price is only $14.99, down from the previous $27.99 and considerably cheaper than other products on the market. TurboTax Online State saves you time and hassle by transferring your information from your federal to state tax filing. Its calculators are guaranteed 100% accurate, or else TurboTax will pay for any IRS penalties, which occur from wrong calculations. The software leads you along the way, suggesting deductions, providing expert advice, and displaying your tax savings at every given point. With TurboTax State, you are guaranteed the Biggest State Refund, or else you will get your money back. Even if you have already completed your federal tax return, log in to TurboTax and transfer the data to your state tax return and carry on from there. TurboTax offers full online support, as well as phone assistance depending on the plan. The chat mechanism is easy to use and those on the other end are friendly, more often than not, and generally very helpful. The website is simple and leads the customer through many questions in plain English or comprehensive Spanish to help input their financial information. The customer service representatives often have backgrounds that give them actual expertise in tax filing. Although TurboTax is based almost entirely online and has had a few newsworthy moments concerning the handling of private information, the company employs all the highest level practices in its business and has shown itself to be capable of productive change to help protect its customers. It is an approved tax filing method and employs Safety Seals on its website to keep personal information of customers as private as is possible. TurboTax is considered to be one of the best platforms for online tax filing, and it’s hard to beat their unique offering to the customer allowing all information to be entered and the entire interface used, only charging the customer when payment is made and taxes are actually submitted. This allows customers to try out the interface and software without making a commitment; also an encouraging thought as to the high quality of the software itself. The online programs offered by Turbo Tax are still under $100, like other competing tax filing platforms, which is an incredible value, especially when the customer is allowed to try the entire chosen program before making a monetary commitment. TurboTax can also gather complicated W-2 forms from a customer’s employer if the customer does not have access to them. Using TurboTax is also a very satisfying experience when it comes to watching your taxes fluctuate up and down depending on what has been entered, the straightforward interface allows customers to view the taxes entered and instantaneously watch the program calculate refund and deductions based on what the customer has already entered. Overall TurboTax is a safe, helpful and useful tool for filing taxes without the help of a personal accountant. This year, H&R Block offers an extra incentive to file your taxes with their software: 5% or 10% FREE when purchasing an Amazon Gift Card. When filing your taxes with H&R Block, you will have the option to put aside some of your refunds for the purchase of an Amazon.com Gift Card. If you choose to use part of your refund for the Gift Card (set aside $100 for the Gift card and the rest of the refund will be deposited into your bank account), H&R Block will give you an addition 5% or 10% bonus; 5% more when using the H&R Block Basic, Delux or Premium Edition, 10% if using Deluxe, Premier, or Home & Business. All you need is the Amazon.com Gift Card claim code, which will be sent to you automatically once your refund is ready. The bonus is FREE and gift cards never expire! It really seems that FreeTaxUSA honestly wants to have people use their tax services for free, and have no intention of charging for it. Besides the Free version, they do have a Deluxe option for $5.95, that users can opt for, but the only difference there is that it offers Priority Customer Support, Audit Assistance, and Amended Tax Returns. Just about any individual will be able to file their personal yearly income tax, with unlimited features, forms, and deductions, for free, while never needing to upgrade. It really is Free. FreeTaxUSA provides users a simple process of interview format tax preparation and they do all the work for you when it comes to inputting all the data into the actual forms users will choose to file. The process is easy to navigate through because of such features as a menu path that guides each user through the steps automatically, an estimator/calculator for users to test out their tax options before they begin to actually file, and the ability to preview your taxes before you submit them. Another benefit users will love is that there is no tricky complicated software installations process. It’s all online. Nobody wants to pay for filing their taxes, and with FreeTaxUSA, you really don’t have to. They offer free filing that supports such features as online backup and data rollover for prior users, printing your taxes, federal tax extension, direct deposit, automatic error checking, and a comprehensive list of forms to choose from. Users can file for Home Owner Return, Investment Income, Rental Income, Self-Employed taxes, and much more. State Tax filing does actually come at a cost of $9.95 and you cannot file dual state claims, so when it comes to filing state taxes with FreeTaxUSA, it is not necessarily their strongest feature. The live chat they offer is a great service, but the site has loads of information, tax tips, tax estimator, FAQs, and easy to follow guides as users go through the interview style process. The process literally will take most individuals no more than 30 minutes and that’s because sections that don’t apply directly to the user will never be shown, the automatic refund calculator updates your progress as you go along and even shows the amount calculated so far, and users also have the benefit of never having to fuss around with software installment and updates. There may be a time users will need to contact customer support. That’s why FreeTaxUSA set up an easily accessible email button, always available during your processing. Much of the support does, however, come from the extensive information provided by a click of a button with easy to understand and in-depth information. Users might want to consider purchasing the Deluxe Version if they think they will need rush support and want to jump ahead of the line and shorten their waiting time (through email that is). FreeTaxUSA holds the same standard that most online services use today to provide their users with security. Their site is protected by TRUSTe, an industry leader in securing website content. All information also gets encrypted through VeriSign, which is another well reputable security source. Sometimes free is not always free. That’s not the case with FreeTaxUSA. The wide array of forms they support, along with incredibly useful features such as interview style processing, tax estimator, tax preview, and the ability to print your return, is what makes this service better than the rest of the free ones out on the market today. Using this site for individual federal income tax filing will get customers the best for their buck. The interface of TaxACT is relatively easy and straightforward. It walks you through each topic, helping you enter information that will determine your refund. It also has audit protection and double-checking, which will help minimize mistakes as you file. The information provided by the simple interface is easy and accessible. Although it does have a substantial library of answers, as well as allowing you access to an agent via phone or email upon payment, it does not give you access to anytime, anywhere online chats with tax professionals or even technical website help, which might make a first-time tax filer a little nervous. If you have some understanding of filing or have simple taxes to file, this might not pose a real problem because the website does offer a great deal of clearly written and easily accessible information. TaxAct features multiple online and downloadable platforms. Once the platform that is right for you has been accessed, TaxAct has a number of different import options for gaining access to your last years’ information. The TaxAct website features calculators, access to their answer center and tutorial videos, leads you through 35 major life changes to help you gain a better refund and more accurate tax filing, and the easy interface allows you to see how what you enter is directly affecting your refund on a step-by-step basis. TaxAct offers a minimum refund guarantee pledge, to help assure customers the best refund possible, and their software helps condense even complicated donations into an easy report to help bring the refund higher. TaxAct has a concise review mechanism that both double-checks the information you enter and also allows you final review over what you have entered so as to minimize possible errors. TaxAct offers support in the form of an online tax help center, and access to agents via the phone or email upon paying for your tax filing program. They do not offer round the clock online chat. TaxAct is one of the larger online-only tax filing firms, and as such, it is a generally trustworthy method for filing taxes. It is recognized by the IRS and offers all basic safety precautions to protect your information from online hackers. You can also download the software and enter the information via your computer, or by purchasing the CD. TaxAct does offer Audit help, and guarantees/pledges to help assuage the anxiety of first-time users. TaxAct is an even more affordable option for filing taxes online, with its deluxe edition available for $21.95, which basically allows you to add a state to your federal income tax and provides you with every help topic or potential feature that they have to offer on their site. The fact that there isn’t immediate access to a trained agent via chat is a downside, and one might consider that the difference in price between a tax company that does offer this feature in their online edition might be worth the value, but if you aren’t interested in chatting with an agent, or your filing is straightforward enough not to have you worried, TaxAct is generally easy to use and offers good features for allowing customers to file in a very inexpensive and straightforward way. Liberty Tax has 4 packages to choose from. Three of these options are geared for individual taxpayers based on the complexity of their claims and deductions. The Premium option is for small business owners, property owners, and self-employed filers. These packages do not include state tax filing, which is offered as a separate fee. It should also be noted, that Liberty Tax does this with great speed and accuracy. E-Filing forms on Liberty Tax is easier than most software out on the market, because after each form is completed, it does the calculations for you on the spot, with one click of the button. An excellent tool they offer is the Tax Calculator. You can use this calculator free of charge at any time that you wish to estimate your W-4 refund, and it’s helpful for keeping up with your tax status. On top of that, the program itself is easy to navigate through because of the questionnaire interview process. The reason to trust Liberty Tax is not only because they have been around for 35 years, but also because they offer amazing support through live chat, phone, and email. They have simplified the federal tax eFiling process by offering questionnaire based form generation, easy design for navigation, direct deposit for refunds, and up to 5 years… yes 5, prior tax data storage. One minor drawback is a limitation on guidance and tax information offered as you fill out the worksheets. Individuals who would like to get definitions and detailed information about tax regulations, as they file their forms, will need to look for that separately in the “knowledge-base” section or live chat with a representative. Liberty Tax stands by their security and guarantees that if there is any oversight with your account funds, you are 100% covered. This site offers the ability to file multiple federal and state tax returns with ease, by offering the tax refund calculator before you even start to file your taxes. Using this tool lets users estimate their tax refund or payment through Liberty Tax, so they can preview their options and decide if they are ready to file. This is a unique tool that gives you a head start on what to expect. Users will also like the fact there is no software to download. Everything is easy, safe and secure online. You have plenty of great options for contacting support. Either you email and get a prompt response within 24 hours, chat online during business hours, or even call for all your filing needs. The knowledgeable staff will guide you through all tax and technical questions. This online program is trusted with multiple security defense certificates from major industry name providers such as Trustwave, Truste, and GoDaddy. Certified and approved by the IRS, if any of your funds happen to get removed without authorization or your account is made vulnerable, Liberty Tax has you covered and will immediately refund you 100%. This online service will be more useful for individuals filing their taxes than business owners. Because it is a very simplified format and any complex deductions might need more assistance and constant guidance through the process. A perfect way to test out this product is by using the free calculator to estimate your tax return before filing and then deciding if it’s right for you. The questionnaire processing does make it easy to navigate through filing returns faster and with direct simple language. E-file has a simple and easy to use platform. The software interface takes users through a step by step process for filing their federal and state income taxes. The questions are simple and are not presented in the complicated language that is used by the traditional tax filing system. The reliable software allows customers to easily enter all relevant information efficiently and the software is designed to find all applicable deductions. The software verifies that all information is correct and if customers need additional support they can speak to one of E-file.com’s professional tax advisors. E-file is one of the simplest tax software platforms available – there is no need to download any software as the entire process is completed online. The customer service at this tax service is excellent and support is available at any time if customers have difficulty using the tax platform. Customers who use the free edition can file their federal taxes at absolutely no charge and for a fee of $19.00 they can also file their state taxes at the same time – this can save a great deal of time and frustration. The advanced software that is used by E-file is designed to find any and all deductions that are available and it is able to accurately estimate taxes so customers do not have to guess. In addition, there are a variety of tools available at E-file that can be used to ensure that taxes are filed properly. Customer support is available 24 hours a day, 7 days a week at E-file. Customers can either send an email or use the toll-free telephone number for support. Customer support can assist customers with any technical aspects of the software program. In addition, customers can also contact a tax professional at E-file if they have questions in regards to anything related to taxes. These professionals have extensive experience in the tax industry and can answer nearly any question in regards to taxes and the IRS. E-file uses the most sophisticated safety and security measures to ensure the integrity of customer accounts. All information is encrypted to ensure the privacy of all customers using this service. Only authorized users are able to see the information contained in tax returns that are submitted through E-file. E-file works diligently to ensure the site and customers’ accounts are not comprised by viruses or other malicious software. E-file is an excellent tax software platform and it is one of the user-friendly programs on the market today. One of the best features is that customers can use the free edition at absolutely no cost. Not only can customers use the free edition to complete all necessary forms but they can actually file their taxes for free. This is one of the only online tax software providers that enable users to file federal taxes at no cost. While finding the most inexpensive tax filing service is generally not the most important feature it certainly adds to the overall value of the service. E-file also clearly states which forms customers will need to submit to properly file their taxes whether they are only filing a simple return for themselves or filing taxes for their business. Overall, E-file is a simple yet powerful tax software program that simplifies the process of filing taxes. eSmart Tax offers basic ‘yes’ and ‘no’ style interview questions to make filling out the actual IRS forms easier and more comprehensible to the customer. They also explain all of their features in an easily laid-out website using plain English. The format in which they list their features and the easy interface, questions, and listing of information all make this site a good one for online filing. They remove the anxiety of filing from the mix, as well, by offering guarantees, calculators that automatically check for accuracy, and a free offer to refile if even a birth date causes the IRS to reject the initial file. eSmart also makes it easy to file for an extension and provides the user with free chat and multiple methods of interacting with customer assistance, which is great for the beginner in the world of online Tax Filing. eSmart offers many easy-to-use features that make filing with them a good choice. Firstly, finding answers to almost anything is pretty easy on their well-organized website. There is a great Q and A section on online filing that helps the customer understand how the system works, and how the easy interface transfers information into forms the IRS actually wants to read. It has IRS approval, and if you use eSmart for more than one year, it’s easy to import last years’ data. eSmart offers guarantees for the highest refund, free re-filing if any mistakes are made by either the platform or the customer, easy postponement, calculators and software to double check, guarantees for accuracy and accountability that include guaranteeing that the software will not make a mistake. If a mistake is made, eSmart will pay any and all fees associated with the mistake. The interface, while very good, may be less comprehensive than some, but the Customer Support rivals the very best, and that can make all the difference. eSmart Tax has one of the best customer support systems of any online web platform. The website itself is easy to search on, and offers comprehensive tutorials, Q and A and Help Center. It’s also directly associated with Liberty Tax, which is a very large tax corporation in the USA and provides phone and email assistance to eSmart customers. Like the best of them, eSmart has an instant chat mechanism that allows the customer to ask questions about filing and get answers instantly. 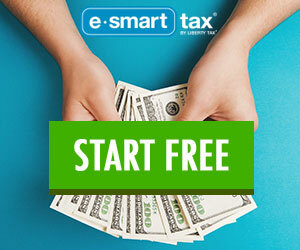 eSmart Tax is a safe and IRS supported online tax filing interface. The fact that it is the creation of a large and trusted tax corporation may also assure customers who are nervous about filing their taxes with a less-well-known filing program. eSmart Tax takes every meaningful precaution to protect your privacy and information. eSmart Tax, although very affordable, is not the absolute cheapest option when filing, but it offers excellent value for money spent. First of all, the customer support offered is one of the best, which can’t be underestimated unless you are so well versed in tax filing that you don’t think you’ll need any help along the way. Access to chat, email, phone, and help centers means there is a myriad of ways to get the information you need while you are in the midst of filing. The guarantees offered are also comparable to the best online platforms for filing taxes, guaranteeing to provide the best refund and completely filing accuracy or any fees will be covered by eSmart. The interface is pretty easy and professional, and the calculators and general information on the website can prove to be very helpful to the customer as the filing continues, especially sections on supported forms, IRS rules and laws, and a great deal of information explained in a way that can be understood. There is also access to a professional CPA for help in case of an auditing, and because Liberty Tax is the company which owns eSmart, there are actual offices and professionals to discuss any issues with. All in all, it’s a great value. ezTaxReturn.com makes it so easy to file your taxes, that it can even be done in a speedy 30 minutes. Users can choose from a variety of online eFiling packages and pay for this product out of their tax refund. The best part is its inexpensive and there are no hidden fees. EzTaxReturn.com is perfect for individuals looking to fill out their tax returns with a trusted and secure site. The process is a simple interview format that eliminates the confusing and complicated language which most tax forms use. ezTaxReturn.com was built by tax experts specifically for making filing taxes easier for individuals looking for a stress-free approach to filing their tax refund. This entire process can take just 30 minutes! The IRS language and legal phrasing can be confusing, so ezTaxReturn.com has developed the interview format for preparing all forms. 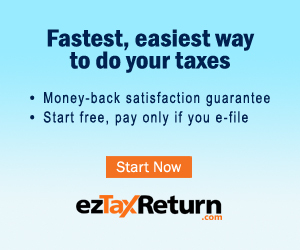 EzTaxReturn.com makes filing taxes just that… easy. The secret behind their success in providing simplified and fast tax filling for the last 15 years, is that they offer an impressive quality of features and options. They offer users the biggest refund guaranteed, step-by-step guidance through interview formatting, 5 different certificates of trusted security, pay out of your refund, online downloads, and so much more. Users have online 3 years of free downloads and secure storage of all data history. EzTaxReturn.com supports an incredible amount of forms for such expenses as home ownership, donations, business, educational, self-employment, and so much more. The vast majority of Americans will be able to file their taxes, with no experience needed because ezTaxReturn.com provides expert guidance through the entire process. With a fantastically affordable price, online download, and biggest refund guarantee, you can’t go wrong with this product. The most prominent feature on ezTaxReturn.com is the impressive level of safe storage and security offered. Users fed up with the usual format of inputting data and filing forms that are difficult to interpret will love the stress-free format of interview questions that guide you through the process. The seal of approval from the Better Business Bureau doesn’t hurt either. One of the things to consider when choosing ezTaxReturn.com is that tax support is limited to email. The reason is most likely because you won’t be needing it. As you process your taxes, ezTaxReturn.com has a built-in support guide that takes you every step of the way with tips, error checks, accuracy assistance, easy navigation, and straightforward questions. Set up is so simple, that majority of U.S customers will find it quick and easy. Your information is guaranteed private and never shared with a third party. Security and safety is of serious importance to ezTaxReturn.com, so they have secured their site with multiple certificates such as Norton, McAfee, Truste, and BBB. They also run 7,000 daily automatic security tests on servers and have the highest rated storage data centers. If you are looking for the option to download an online eFiling service, this is the one. It’s affordable and stands by its claims of accuracy by offering users a largest refund guarantee. The security available is the safest and most reputable systems around. This is a product made specifically for Americans filing their personal yearly tax return. The only assistance is offered by email, but don’t worry, you won’t need it. Clear and straightforward questions will guide you through adding all the data onto your forms. *By using our links, the Affiliate sites know that we referred you. Any items you add to your cart and purchase during the same internet session will automatically send us a commission on the total sale price. It doesn’t cost you anything and it helps us cover our monthly expenses, which ultimately allows us to stay afloat just a little longer! Best price we could find for federal and state filing fees. Easy to use. Automatic refund calculator. Support for part-year nonresident state tax returns. A professional tax consultant is not available. Deluxe edition costs an additional $5.95 for Audit Assist and Priority Support. Can’t import W-2, 1099 or other necessary forms into program. Good customer support options. Assistance with Affordable Care Act tax implications. Import W-2 forms & 1099-B forms from participating institutions. Ensures 100% accuracy. 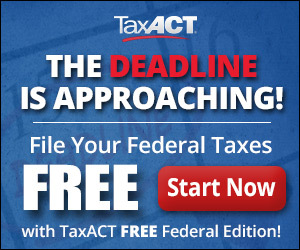 Does not offer free federal e-filing for 1040EZ. Can’t be used for big business returns. Does not offer the services of a professional tax consultant. Free federal filing. Couldn’t find the answers to many of our questions. Website does not explain features. Missing many features wanted in a tax service. No ability to import W-2 or other forms. No live chat or user forums. This online tax service charge the same fee regardless of the type of 1040 you are required to file. It does not charge extra for additional forms or self-employment income. This service does not require a credit card to file. Although this service answered several of our emails within an hour, ezTaxReturn does not publish telephone numbers on its website nor does it provide chat support. This service does not provide service for filing business returns. Select which service you prefer in the poll below and share your recommendations in the comments below.